Life moves slowly in Hasankeyf, a town on the banks of the Tigris in the heavily Kurdish region of far southeastern Turkey. Geography and political unrest have kept the modern world largely at bay. During my recent visit, Ali, a local artisan, demonstrated his trade for me—weaving rugs on a loom built by his grandfather, working in a room hewn from the limestone cliffs by a more distant ancestor. Then the 21st century intruded, in the form of a lumbering Ankara Express bus. A group of Chinese tourists filed out, then stood in silence, absorbing the centuries of history before them. Archaeologists believe Hasankeyf may be one of the oldest continuously inhabited settlements in the world, dating back some 10,000 years. The cliffs lining the river are speckled with gaping black holes—homes carved out of the soft rock by cave dwellers thousands of years ago. What remains of a citadel built by the Byzantines in the fourth century A.D., and later expanded and reinforced by the Artukids and Ayyubids, rises above the city. Other ruins show the influence of Assyrians, Romans, Seljuks, Mongols, Ottomans—successive waves of conquerors who fought for dominance of the lucrative trading routes in northern Mesopotamia. Hasankeyf may soon be hit by another conquering wave—this time, a watery one that could drown its history. Fifty miles downstream, near the village of Ilisu, a consortium of German, Swiss, Austrian, and Turkish contractors is preparing to build a massive hydroelectric dam that would catch water from the Tigris just before the river spills into Syria and Iraq. If all goes as planned, most of Hasankeyf will be submerged by a reservoir. Ali pointed out the projected waterline—about halfway up the spire of a 15th-century minaret. 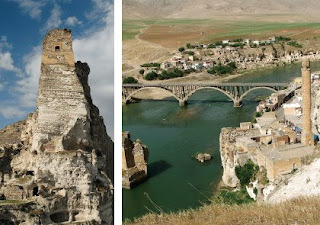 For more on Hasankeyf and the Southeast Anatolia Project, see Sept. 3 post.